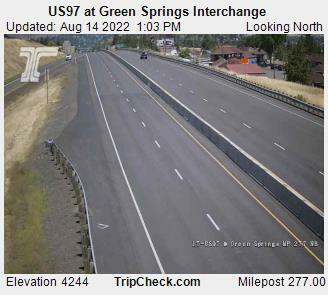 Oregon Highway 66 traverses the Southern Oregon Cascades between Interstate 5 in Ashland and Highway 97 / Highway 140 in Klamath Falls. From Ashland, the route passes through the communities of Greensprings, Lincoln, Pinehurst, and Keno, ending in Klamath Falls. The Highway follows portions of the route of the Applegate Trail. This route offers beautiful scenery and access to the Emigrant Lake Recreation Area, Cascade-Siskiyou National Monument, Jenny Creek, Hyatt and Howard Prairie Reservoirs. This is a historic highway, so it has not been dramatically straightened and widened like many of today's highways. Consequently, the road is very curvey as you climb out of the Rogue Valley to the crest of the Cascade Range. There are less curves as you proceed to the east.